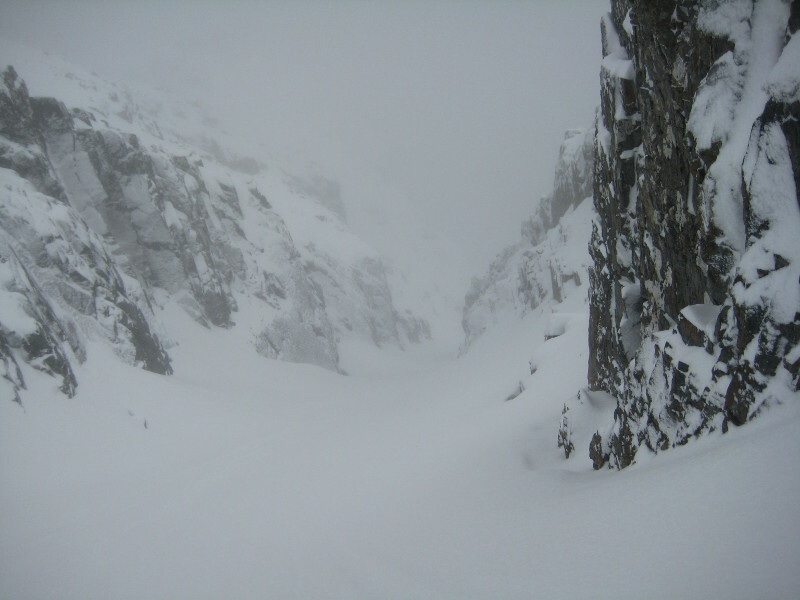 Ben Nevis is one of the most popular mountains for gully skiing in Scotland. Ben Nevis is also covered by the Scottish Offpiste Skiing & Snowboarding: Nevis Range & Ben Nevis guidebook by Kenny Biggin, published in November 2013. 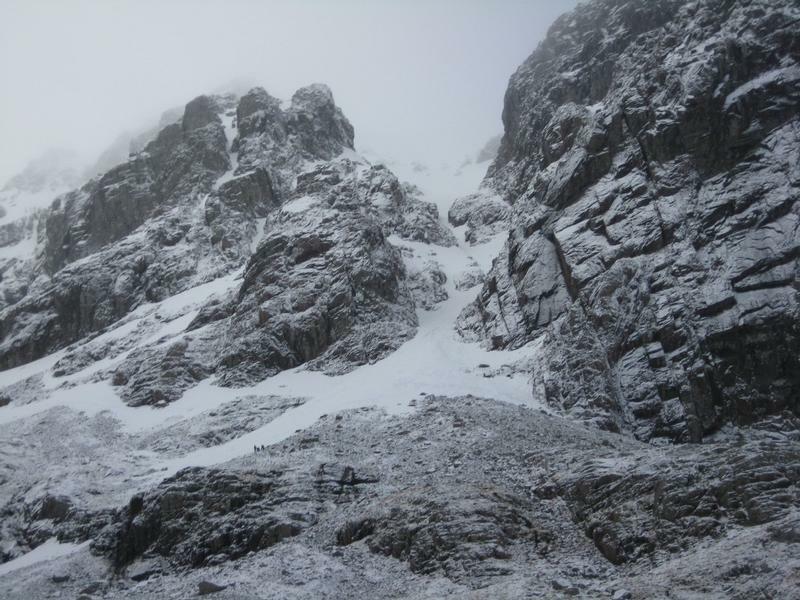 There is one relevant Scottish Avalanche Information Service forecast for Ben Nevis. Number 5 Gully bounds the southern side of Carn Dearg Buttress, and in it's upper reaches, is more of a small corrie than a gully. This large funnel collects snow well - often too well, and significant amounts of avalanche debris can regularly be seen below the gully throughout the season. In the right conditions it offers an interesting descent through some fantastic rock scenery. The top of the gully is located between the two tops of Carn Dearg, and is marked clearly on the OS 1:50000 maps, although it's best to climb gully first anyway. The upper area of the gully opens out to a large snow scoop on the left, and a narrow gully on the right. The 2 sections are split by an arete. The narrow gully offers the best descent. If you are having difficulty locating the top of this, there is a large boulder at the head of the gully, and a small cairn can be found about 20m away on the North side of the gully entrance. A steep entry is followed by a nic e gully that then opens out into a large snowfield. This then funnels into a narrow gully before opening out to another smaller bay. Lower down,take the right of the second two narrows (worth checking on way up). After this, there are no more difficulties, and you will either have a bouncy finish on avalanche debris, or a nice fast run out onto the scree fan. Notes: The avalanche possibility is more of an issue than the grade. Descent of Number 5 Gully, 29th of April 2012. Along with Tower Gully, this one of the more popular gully descents on the mountain. It's also the most popular descent for climbers returning to the corrie floor, so be aware of this. I've been in Number 4 when a skier decided to use the large number of people in it as mobile slalom poles - it was quite unnerving, and not to be recommended! The very top of Number 4 Gully is the steepest section, and there should usually be a way through the cornice on skiers left. After that the angle is quite amenable for Grade I, and you should get a good descent all the way to the lochan in Coire Na Ciste at least. Up until Spring 2012, there was marker post at the top of the gully, but it has been removed and has been replaced by a 2m high cairn instead. See this news article. The actual gully itself is very short (100m), but the slope below is several times the height of the gully, so it's worth getting a big run in. The top 10m is the steepest, often with a sizeable cornice to negotiate. 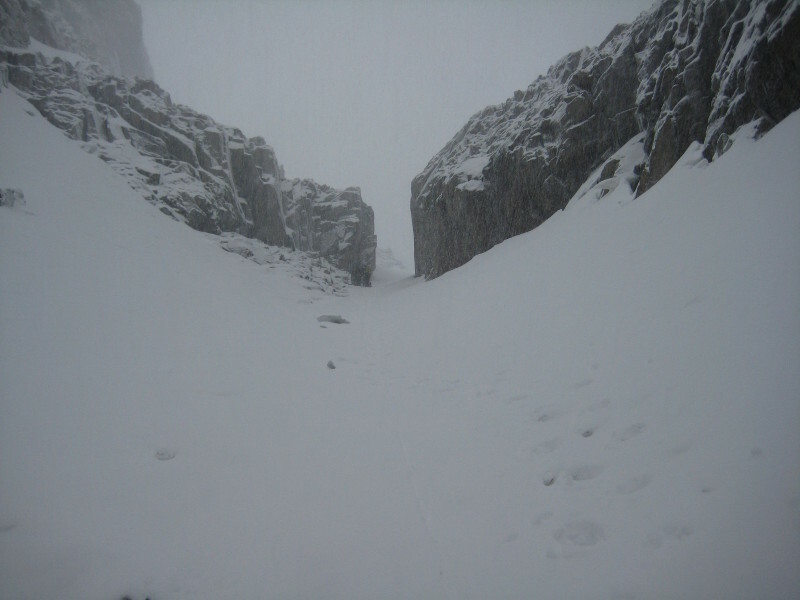 It is usually easiest to enter from skiers right, cutting back into the bed of the gully. If this isn't possible, then an alternative may be down the small chute to the skiers right of a large protruding rock below the cornice. This is steeper, but may contain softer snow if the normal entrance is scoured. Notes: Steep 10m at top. 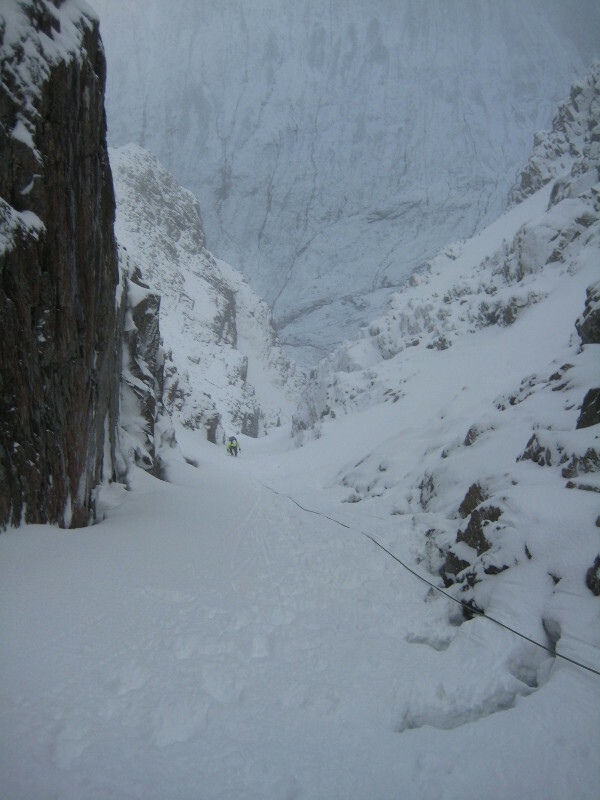 Number 2 Gully is a narrow chute tucked up behind Comb Buttress in Coire Na Ciste. In lean conditions, it can contain a considerable amount of ice, so it makes sense to climb it first to get an idea of the snow conditions, and see if you are happy with the width of it! As will all of the gullies here, the cornices can be enormous (for example, May 2010!). However, the entry to the gully is easiest on skiers right. Arrival at the top of the gully could lead to to think that it simply isn't wide enough for your skis, but if you've climbed it first, you should be reassured otherwise. The top section of the gully is very narrow, but is does gradually open out and gets progressively easier. A great little gully, and well worth seeking out the right conditions for. This is one gully that you really do want to make sure that there is no one ascending it as you are descending. There's isn't a lot of room in the top section of the gully, and meeting a climber would be problematical. It is a popular climb, so worth bearing in mind. Notes: Only grade I when skiable, but narrow. A descent of Raeburn's Easy Route is a serious proposition. It is principally a descending traverse, involving skiing above a cliff for it's entirety, followed by a 30m abseil down an easy angled ice pitch. It is definitely advisable to climb the line first! To descend, start by a shallow gully, then turn skiers right, staying high on the traverse line. A prodruding rock marks the point above the easy angled icefall. 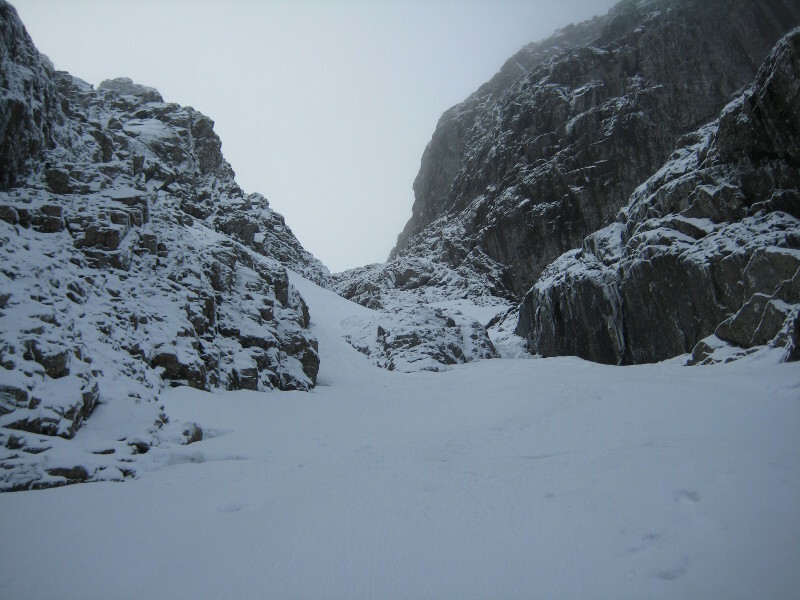 Find a suitable anchor and abseil off into Coire na Ciste. The abseil is about 30m. The descent from the end of the abseil is straightforward. Notes: A serious descent, involving an abseil over an ice pitch. One of the longest lasting big lines in the country, Tower Gully can often hold skiable snow low down well into the spring and even summer. The top section of the gully is steep and narrow. As soon as it begins to open out, you should traverse (skiers) right below Gardyloo Buttress to avoid dropping over Tower Scoop, a 2 pitch ice route. Once far enough right, the snow slope should open up below you, and the way is obvious. It's now a case of seeing how far the snow extends! The easiest descent listed for the mountain, but quite a spectacular run down the Eastern shoulder from the summit to a break in the cornice, then down into Coire Leis itself and as low as the snow will allow. This may be the best option when cornices higher up the mountain barr access to the gullies.